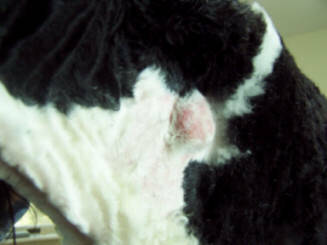 Joey's lump as it appeared when I shaved his neck with a 15 blade. 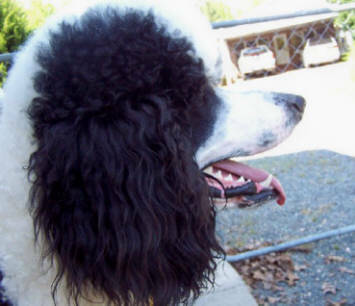 When Joey was about five months old, we noticed that he had a lump about the size of a dime on the left side of his neck. 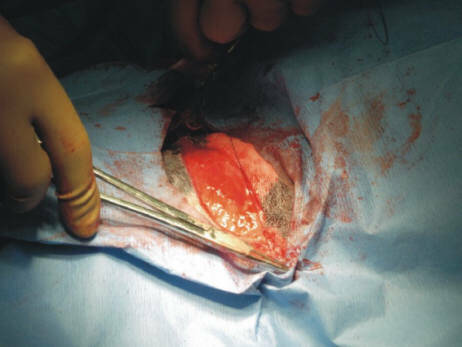 As the lump seemed to be inside the skin and not attached to the substructure, we guessed that it was a lipoma (fatty tumor) which is benign. 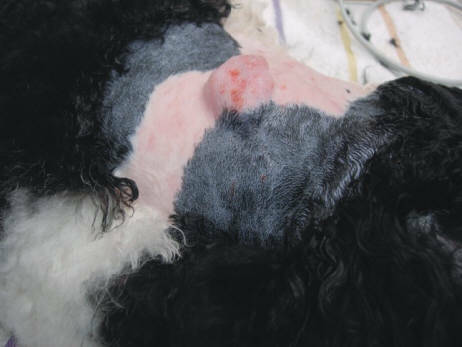 Although lipomas frequently occur in dogs eight years and older, they can occur in puppies. 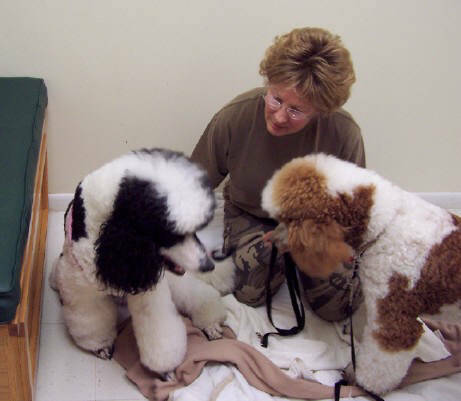 By the time Joey was about ten months old, the lump had grown to about the size of a quarter so we had our veternarian aspirate the lump to inspect the contents under a microscope. The prognosis was inconclusive. 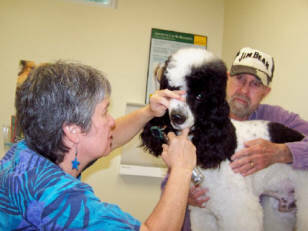 Dr. Staggs suggested surgery to remove the lump so she could send it to a lab for a histopathology report. After aspiration, the lump was the size of a dime but filled back up again within a couple of weeks until it felt to be about the size of a quarter. You can imagine my surprise when I shaved Joey's neck in preparation for his surgery and discovered the lump was the size of a walnut. (see photo right) Joey's hair is so thick that feeling the lump through all that hair did not give a true representation of its size. 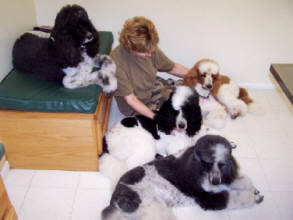 (Left) Monday morning we all took Joey to the clinic for surgery. 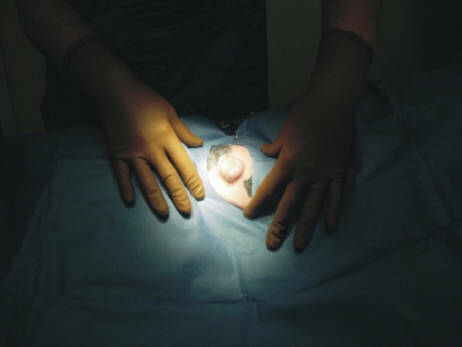 (Below) Dr. Staggs was kind enough to allow me to use pictures she had taken during surgery. Right and below: Scotty and I are waiting for Joey's anesthesia to wear off so we can take him home. Jyah and Sydney have had surgery before and stayed on the other side of the room. Dr. Leslie Staggs did a masterful job on Joey's surgery. 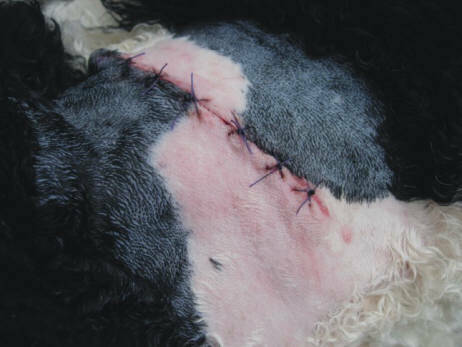 Above left, Glenn is showing the sutures and the size of the scar. Above right, we've placed a pad over the incision, put a vet's stocking over the pad, and then wrapped a towel around Joey's neck, securing it with duct tape. We originally held the towel together with large safety pins until we found one had come out and fallen in an open position in the dogs' yard. 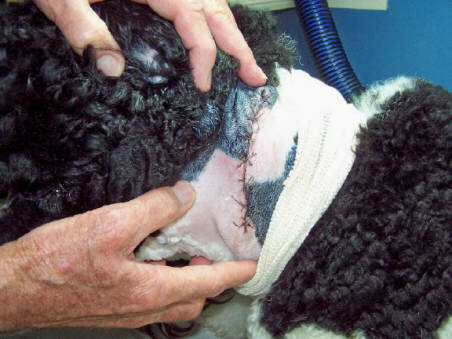 Joey's stitches were to stay in for two weeks and he was NOT to play with the other dogs. 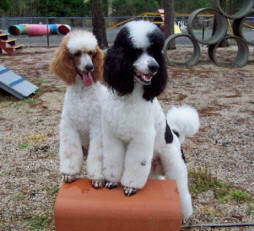 Tall order for an energetic one year old puppy! 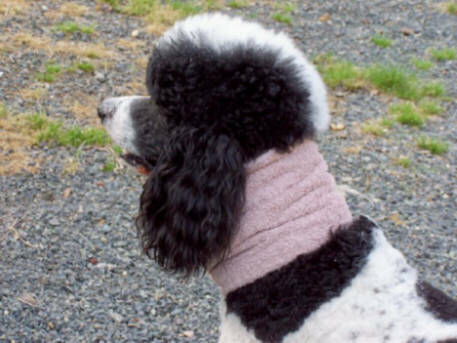 Joey's histopathology report from the lab said "benign ruptured pilomatrixoma (also known as pilomatricoma) with inflammation." Pilomatrixoma arise from a disordered growth of the hair follicles and are usually solitary rather than multiple in nature (as are some hair follicle tumors). They are almost all benign and can be permanently cured by surgical removal. 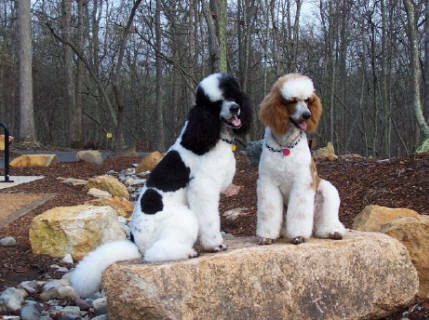 There is a genetic predisposition for these tumors to develop in breeds of dogs that have continuous hair growth - such as Poodles. Although benign pilomatrixoma is fairly common, there is also a very rare, multiple, malignant form of pilomatricoma which is usually recognized very early as it spreads through the body and causes clinical illness.